Coming from a single developer – a man by the name of Johnny Ostad – comes a new entry into the retro style RPG. Having seen the trailer and gotten a distinct early Zelda game vibe from it, I was very keen to dive into the quest and see what Shalnor Legends: Sacred Lands had in store for me. See, back in the day, when I was a poor student, I did spend an entire term’s grant on a Super Nintendo just to play A Link to the Past, so I was well up for this game. The story of Shalnor Legends follows a young elf by the name of Rynna, who comes to the Sacred Lands to try and overcome a mysterious Trial. It turns out that when entering the Sacred Lands, the only way to leave is if someone completes the Trial, and even death doesn’t offer an escape. As you explore the lands, there are characters to meet and interact with, only some of which are still alive! Happily, most (but not all) of the ghosts in the land are more than willing to help you on your journey, and often can provide you with clues as to what you can do. One will even sell you a fishing rod, and thus unlock a fishing mini game which just put the cherry on the top for me. One character that you will need is known as The Keeper, and will guide you where you need to go to begin the trial. First impressions are like wallowing in a huge rose tinted bath of nostalgia, with absolutely charming 16-bit style graphics and period correct music. Starting out unarmed, once a sword is found – and then a bit later a bow – then you can start chopping down bushes, gathering gold and picking up collectable items, such as Bloodleaf and Leather Strips… again, just like Zelda. 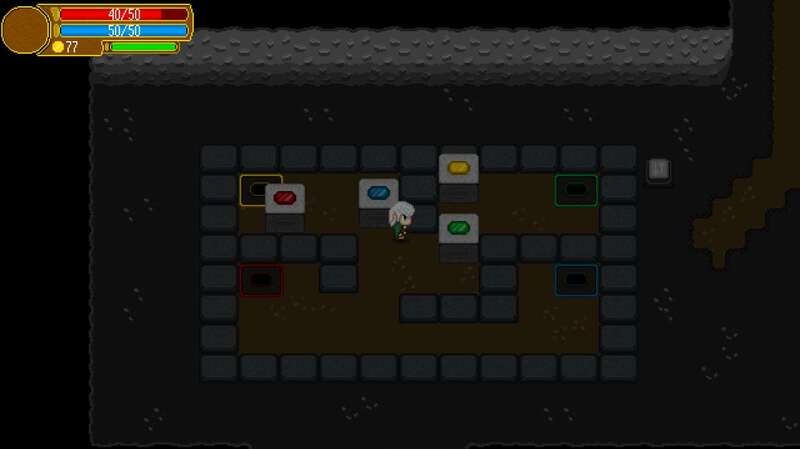 These components can be used to brew potions, and also in conjunction with the gold you find, used to upgrade your gear. As you explore the regions you will come across NPCs who can upgrade your armour, your sword and also your bracers, which has the effect of improving your bow. Basically put, the better your gear, the better your chances of surviving, so it’s well worth doing. The gameplay found within is absolutely classic as well. Pointed by The Keeper to the first region to explore – the desert to the east of the place where you arrive in the Sacred Lands – you have to explore and figure out what it is that you need to do, fighting and puzzling your way through the rooms, defeating a boss and then looting the chest to get a new item. Each region has a dungeon, and each of these will give you a new style of arrow to use, ranging from a fire arrow all the way up to one that splits into a group of crows, which then track the enemies on screen. Each of these arrow types will also open up a path to another new region, so using fire arrows will melt ice blocks that might be blocking your path, for instance. Progression is linear, but finding where to go and how to use your new powers is a huge part of the fun. 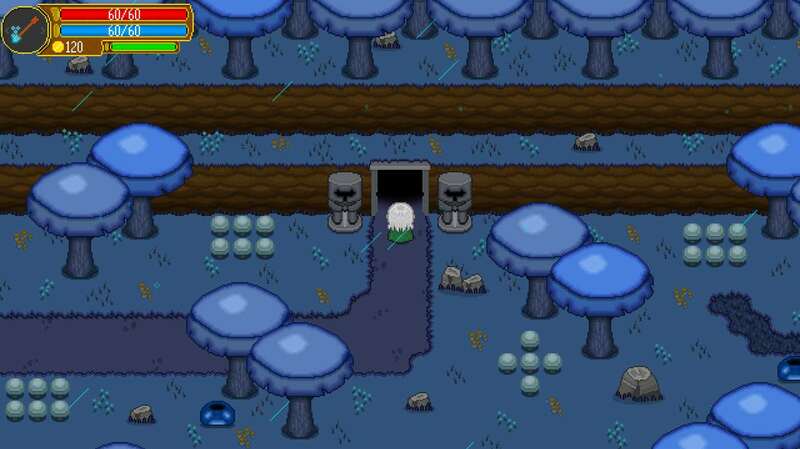 There are a plethora of optional puzzles and caves to explore as well, and in them you can find mana and life stones to collect. Collecting three of each will upgrade the respective bars, and as mana is needed to fire arrows and life is needed to, you know, stay alive, then it’s worth hunting these stones down. 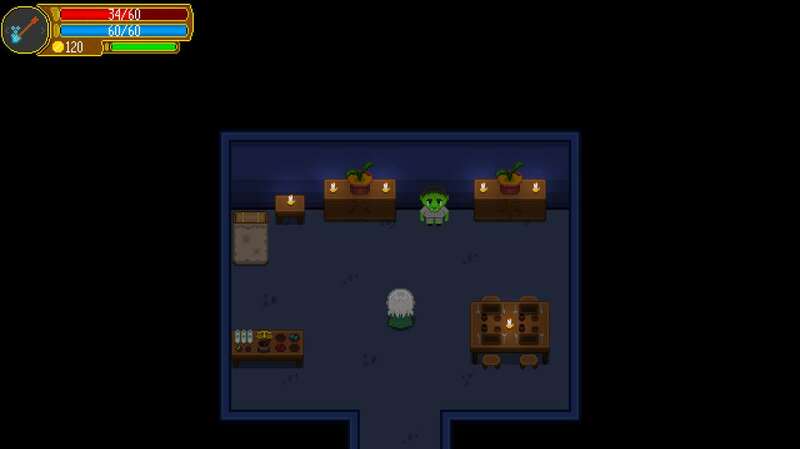 There is a ghost merchant to find in each region too, and these will not only sell stones, but new potion recipes and other items that can make your life easier. For instance, one ghost merchant sells a Stoneskin Elixir recipe, and drinking this potion increases your damage resistance by 30% for 90 seconds; when there is a room full of spinning blades and fireballs, this potion can be the difference between life and death. Each region of the map that you explore has a distinct look and its own wildlife to overcome, ranging from a desert all the way through to a jungle. The design of the enemies is very good, and with imaginative bosses to take down that you have to work out how to beat, the challenge in this game is real. The only thing that is missing is some kind of audible warning when your health is getting low, as quite often I’d wander blithely around with one HP left, dying whenever a monster so much as looked at me cross eyed. Other than this little niggle, and the very rare death due to getting hung up on the scenery, the gameplay and presentation of Sacred Lands is top notch. All in all, Shalnor Legends: Sacred Lands is no more and no less than a Zelda game for the Xbox. It is charming, great fun, and makes you think; to say it is the work of one man is absolutely staggering when you consider what he has managed to achieve. The little niggles cannot take away from the fact that this game is almost perfect, and has a real “one more go” appeal. The puzzles may be diabolical, but this is all part of the fun and the triumphant feeling you get when you figure it out is amazing. If you have any interest in RPGs, retro or not, then you need to play this game. It’s basically Zelda for the Xbox!